Mary Cleage was the third of the four daughters of George and Martha (Rice) Cleage. 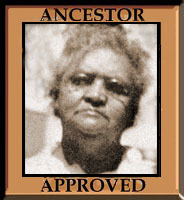 She was born free in Athens, Tennessee in 1874. Her parents were unable to read or write, but Mary and her sisters were literate. In 1892 Mary Cleage married William B. Loving in Athens. C.F. Evans was a witness. In 1900 Mary had no children. She was not working outside of the home. William was working on the railroad as a laborer. William and Mary were enumerated in McMinn County, on page 12 of District 18. I do not know who William Loving’s parents were, however 57 year old Edmonia Loving, who lived next door, is the right age to be his mother. Unfortunately, I have not been able to find out any more about her. A few houses away Martha Loving and her two daughters Lula and Minnie lived. Later in 1900, Minnie Loving married my grandfather Albert’s brother Henry Cleage. On page 13 of District 18, Mary’s father and sisters were enumerated. Several doors from them were Tom and Sallie (Cleage) Waterhouse. Sallie was Lydia Cleage Glass’s sister. By 1910 William and Mary Loving had been living in Indianapolis, Indiana for several years. William worked as a janitor. Mary did not work outside of the house. Within the last ten years they had a child who was dead. The Lovings lived in a rented house. 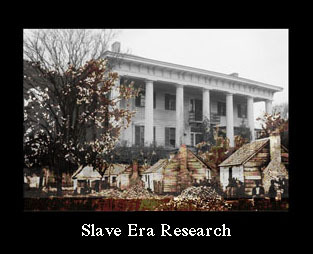 Mary’s sister Anna Cleage, a widow, lived with them. Anna had one daughter, twelve year old Mozena. Mozena lived back in Athens with her father’s sister. Wiley Evans was their lodger. He did odd jobs for a living. 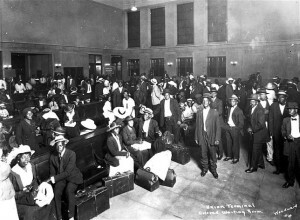 African Americans arriving from the South in the early 1900s found an established black community with churches, businesses, and social organizations. Indianapolis had three black-run weekly newspapers by 1900, the Freeman, the Recorder and the World. 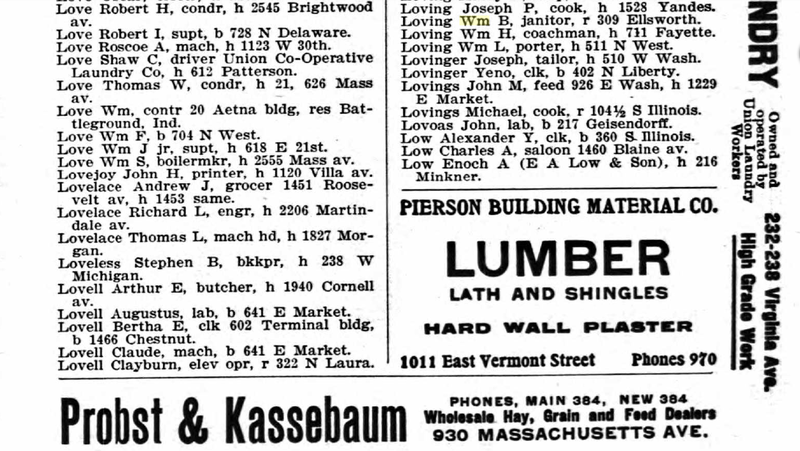 The Recorder often ran a directory of African-American businesses in its Christmas issue. 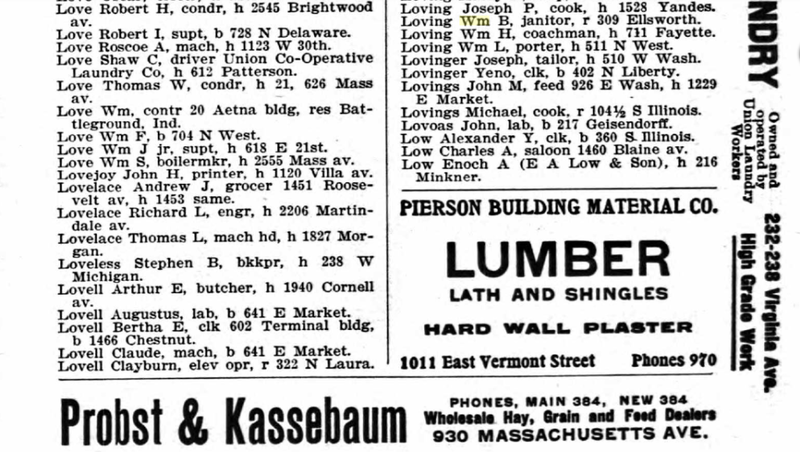 In 1901, this listing included restaurants, hotels, and grocery stores, as well as barbers, physicians, dentists, lawyers, dealers in coal, ice, oil, and junk, and even a clairvoyant. My grandfather, Albert Cleage, two of his brothers and his sister and their families were living in Indianapolis at this time. I wonder if the Lovings also attended Witherspoon United Presbyterian Church. In 1920 William worked as a laborer at a mill. Mary was keeping house. Her sister, Anna did laundry for a private family. Anna’s daughter, Mozena, had joined the family and was a cook in a private home. They rented their home. Mozena married Clinton Sherman in 1922. He died soon after. She continued to share the family home. William was working as a fireman in 1922. In 1923 he was again a laborer. Mary Cleage Lovings died in 1929 and is buried in Crown Hill Cemetery in Indianapolis. She was 53 years old. My great grandfather Lewis Cleage is also buried there. 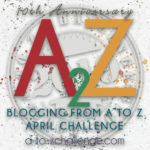 In 1930 William and Mozena were still in the same rented house. He was working on the railroad and she was doing laundry for a private family. Mozena died in 1932. She was only 34 years old. In 1940 William lived in a boarding house and hadn’t worked in the past year. He was 68 years old. That is the last I found of the family. Because I started out writing about those who had been born into slavery, I decided to mention when I got to later generations that they were born free. It does say a lot, I’m glad you noticed that. I know most people’s lives were short and full of hardship back then, but this particular family just struck me as particularly short and tragic. Married young, had only one daughter who survived. Mary dies in her fifties. Her daughter marries and her husband dies shortly after, then she passes at 34. William lives on alone and fades into obscurity. Man. That’s a bleak start to the morning. They struck me the same way. When I started searching them, I had high hopes for Mozena. WoW Mozena…..that’s how some of my Ancestors are they just go into obscurity. Great Piece. Lonely life. Glad you wrote about them.